Today it is a very important day for Mexican Food Memories and me, we now have a YouTube Channel, you can find me as “Mexican Food Memories” and this is the first recipe I am sharing with you there, so at the end of this post you will find the link for the Video Recipe. Please don’t forget to subscribe and like the videos. Taquitos dorados is one of my family’s favourite recipe, hehe! I know, I always say this and it seems that all the recipes are my favourite, but believe me, this dish together with sopes estilo Sinaloa are just the best of the best, yum! I think what makes these recipes so delicious is the flavoursome beef stock that we eat them with, it just make the taquitos so amazing. In my house, my mum always asks us how many taquitos we are going to eat and she will serve on a plate exactly the number of taquitos that you said, for example, I always eat around 5!! Yes, believe me, they are so good that if I could I would eat more! But my little belly can only handle five! Another good thing about these taquitos is that yoh can eat them with anything you like, for instance, if you do not like sour cream, like my husband, you do not have to add that. So basically you can pimp your taquitos to suit your palate, cool, right? In my case I put lots of veggies and my favourite thing is that delicious and mouthwatering broth (OMG! I am salivating while I write this) if I could I would just put all the broth, but my mum never lets me, hehe! Make the broth. In a large casserole dish put the meat, bone, tomatoes, onion, garlic and cover them with enough water, not too much otherwise you will loose flavour, I used two pints, enough to cover the meat. Bring everything to a boil and reduce the flame to low. Add some salt and pepper. Let it simmer slowly, make sure to remove the beef impurities (the foam that forms on top while the meat is boiling). While the beef is cooking, prepare all the veggies, sour cream, feta cheese and keep aside. Also while the beef is cooking, boil the potato. Peel it and cut it in chunks and boil until soft. Mash it as if you were making mashed potato. Add some salt and keep aside. After an hour, turn the heat from the broth off. Take the piece of beef out and put it on a plate to cool down. Discard the bone. While the beef is cooling down, take the tomatoes, onion and garlics from the broth and blend them with some of the liquid, add the beef stock cube and put these sort of salsa back into the broth. Add one tbsp of tomato puré and dried oregano. Let boil for 15 min. Check if it is well seasoned and then turn off the heat and keep aside. Now the beef. Shredded very finely and then chop it. Mix it with the mashed potato and it is ready to make the taquitos. Warm the tortillas a little bit, so they are easy to handle. Put around 1 tbsp of beef/ potato mix in a tortilla, roll it and set aside, then to keep them from opening while you fry them, put a tooth pick in the middle (see pic), in one tooth pick you can put two tacos. Keep doing this until you finish filling all the tortillas. Once they are all ready. Heat a frying pan and add the oil. To check if the oil is hot, just put a little piece of tortilla and if it fries quickly, your oil is ready. Then add your taquitos, do not over crowd the frying pan, maybe put four and then other four. Once they are fry, put them on top of some paper kitchen towels to drain the oil excess. To serve your taquitos. 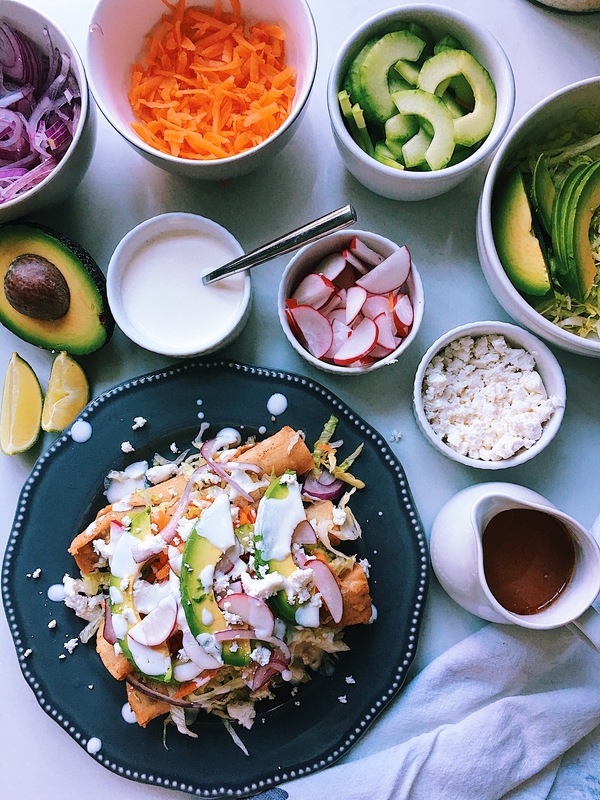 Put the taquitos you will eat, then top them with the veggies in this order: lettuce, carrots, red onion, avocado, cucumber, radishes, cheese and sour cream, then serve the hot broth in a little jar or cup. To eat them just pour some of the hot broth over the taquitos, add some spicy salsa and a squeeze of lime. Enjoy them and maybe eat some more!